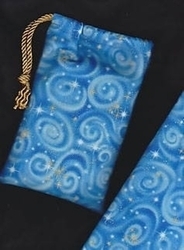 On azure blue fabric, elegant white spirals from a wand create a magical spell on this White Magick rune pouch! Gold and white stars mark touch points of the wand on the surface. 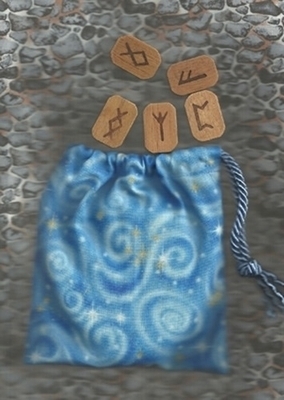 This bag will coordinate beautifully with many runes sets, mini oracle, or Tarot decks. As you can see in the photo, it looks good with wooden runes. 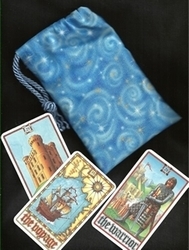 Details: One short sized tarot bag (approx. 5 x 6 in.) that will hold a mini tarot deck or a set of runes. Color scheme: metallic gold stars, blue, and white. Choose a cord color from the option box below.